Black Fathom Depths is in the very NW corner by the Zoram Strand. which towns have sky masters? Where does the portal at the Northeast of Ashenvale lead to? Also, what lvl are the mobs there? cant find thislefur villige please help! Forest Song is NE Ashenvale, keep following the road to NE when you can head south toward Barrens and its there on the left. Dor'Danil Barrow Den is kinda SE but not too far, you should see 4 Forsaken guarding a little camp with bottles - from there you should see the barrow den. That place is quite hard to solo at the recommended level btw - i did it as a 29 rogue with a higher level priest as backup. I been told its coordination at 50,60. But how to apply to the map? Can someone just kind enough to tell the location? where is zoram'gar outpost? Is it past Splintertree outpost? The horde fp is around 74,63. You'll see it on the left just as you run into splintertree post. Its to the South East of Ashenvale, a place called Silverwing Grove. the portal guarded by the green dragon flight leads to an area called The Emerald Dream. similar portals are in Duskwood, The Hinterlands, and Feralas. these portals wont open in the burning Crusade Expansion, but rather in the next expansion along with the Continent of Northrend. Thanks for the great questions! Where do i get teh quest that gives dortol's rod of transformation reward? the furblog thing? I've got a question about the level in Ashenvale and Stonetalon Mountains. I'm currently in Darkshore, level 18 hunter, and fed up with this zone. I'd like to go to a new zone asap, but I don't know if the quests in Ashenvale are too hard for my character. Is it better to go to Stonetalon first? For those of you looking for the Achievement, 'Bough Shadow' is in the Northeastern corner of Ashenvale. It's supposedly a portal to the Emerald Dream. The howling vale's coordinates are 53,37. It's just to the west of the road right below felwood. where's the picture of the location? Anyone know where the fountain here is? Trying to do the Shaman quest and cant find the darn thing. i expected to find a map here . . . In this map, the lake east of TALONDEEP PATH. To west, the lake with a island, is the STARDUST RUINS, used in the quest CALL OF WATER. Blizzard still has BFD listed in Northern Darkshore. They haven't placed the acutal instance where it is in Ashenvale. I had played this game on some of my friends accounts a while ago, and I just recently finally got a copy of the game myself and was like, "Isn't BFD in Ashenvale". I hope they did a revamp for the Expansion pack. I don't have that yet some I'm not sure if they revamped the map. Northern Zoram Strand in Ashenvale. Keep an eye out for the meeting stone. add on.... Or did they just move it from north to south? It was still called Blackfathom Deeps in Archemonde. I am not sure what is meant by the reference to 'Northern Zoram Strand' but I found Blackfathom Deeps no prob....is N.Z.S. the instance that used to be there or what? Blizzard originally ment to put BFD in Darkshore, but instead changed it to the Zoram Strand in Ashenvale. 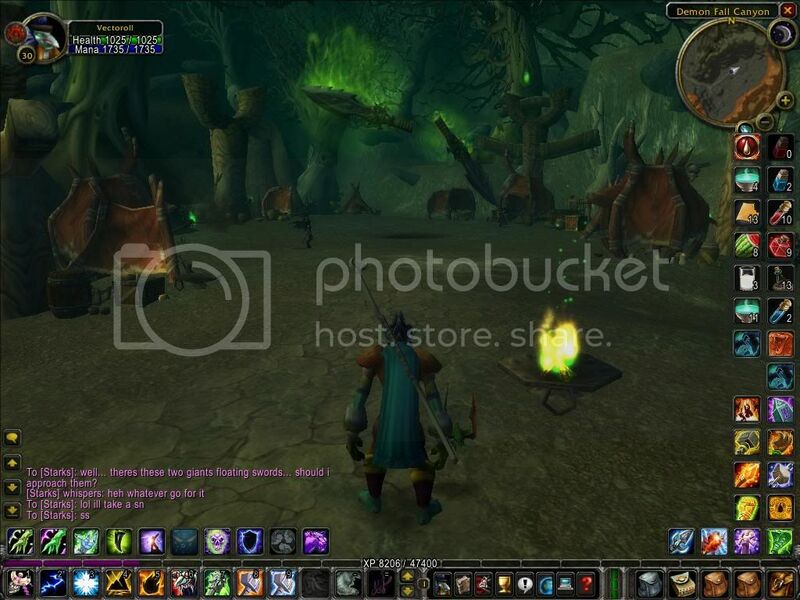 The old entrance can still be found in the northern ruins in Darkshore (I suggest going because there is a lvl 19 rare mob that appears and drops a rare ring) the instance is gone but the building is still there. If you look at the game manual (not the computer version) from the older copies of the game it still shows BFD in this area. I just spent a lot of time in Fire Scar, and wasted a lot of demons, but couldn't find the magician to get the tome. Any suggestions? There is also lots of Naga svimming around. Plus the orc base has a flight path. I think this is one of the most contested areas when it comes to PvP'ing for the first time (for those wise enough to not to flag themselves while in their home territory). The Horde has a small outpost located in the southern part & the Alliance has a quest in the northern part (along with the entrance to the Blackfathom Deeps instance). This means that there's usually a few level mid-20's people hanging around. Never mind I found it. It is to the Northwest of Astranaar, just west of the first set of mts you come across to the left of the road as you're heading north. Peace is but a fleeting dream! Let the NIGHTMARE reign! There are 4 portals I know of: Duskwood, Hinterlands, Blasted lands and Ashenvale. Blasted lands host the Dark Portal, while all the other three should take you to the Emerald Dream. Where Ysera the green is. "In that age, there were many dragonflights. Yet there were five flights that held dominion over their brethren. It was these five flights that the Titans chose to shepherd the budding world. The greatest members of the Pantheon imbued a portion of their power upon each of the flights' leaders. These majestic dragons (as listed below) became known as the Great Aspects, or the Dragon Aspects." "Eonar also blessed Alexstrasza's younger sister, the lithe green dragon Ysera, with a portion of nature's influence. Ysera fell into an eternal trance, bound to the waking Dream of Creation. Known as the Dreamer, she would watch over the growing wilds of the world from her verdant realm, the Emerald Dream." Copy paste the link into your browser. There is another portal leading to the emerald dream in feralas. Its south of desolace, then east. Im guessing each portal is guarded by a patrolled emerald dragon and actually guarded by another. DONT ATTEMPT TO TAKE ALONE! I went there as my 30 druid and got stomped of course. But a sheer act of detrmination (and a facination with dragonkin) i died/respawned closer and closer to the area till i got next to Dreamwalker. I tried running beeline into the portal but nothing happened and i got brutally slaughtered (3927 dmg). makes me think Blizzard may be thinking expansion pack. That would be sweet. I found these two floating daggers at the top of the hill with huts and sucubus-like demons around them. The wierd thign is they dont do anything, like they dont attack you when you approach. Heres a picture. The only thing I've ever found here was the large monument to Grom as this is where Grom and Thrall fought Mannaroth in WC3. Has anyone found anything down here? Or perhaps quests that send players here? So far all we have found is Diathorus, a level 34 named demon who doesn't drop anything but copper. At best it's a nice place to pick up some interesting rare-drops off the demons. The moonwell is near a Dryad, just northwest of Raynewood Retreat. You have to go around a little indention into the mountains though. Just keep moving north and west along the mountains until you reach a little path to the north, follow that path. Ok I just read all the posts about where the wells are....so I ran around and took down the coordinates of my position while I was standing in the middle of the wells. to get there run up the road that is east of Raynewood on the map, take your first right and basically make a uturn around the mountian you will then see a lit path with some lvl 20+ mobs. Night Run is immidately east of Raynewood Retreat and directly west of Satyrnaar on a small mountainous peninsula that can only be reached from the north by the mountains on either side. Does anyone know what's up with the floating green shard in Night Run? The write-up on Night Run says it is West of Satyrnaar which leads me to believe that Satyrnaar is directly East of Night Run in the Northern Mid-Ashenvale area. Currently, there are no posts on the location of this area so I thought it a good idea to post this one. Follow road NE past Splintertree outpost, past warning markers(? ), gateway on left. Watch for stealthed satyr in gate! Ordil'Aran is just northeast of Maestra's Post in Ashenvale. It is just south of Bathran's Haunt. Going to the Veiled Sea from the south end of the Zoram Strand you can find quite a few secluded spots which are creature-free, allowing decent mid-level fishing without interruptions.